There are cacti which grow in rainforests. Conditions here are completely different, so these plants look very different. You may not believe it, but this is a cactus growing on a tree. A plant which grows on another plant is called an epiphyte. This is an epiphytic cactus called Rhipsalis, and there are many other epiphytic cacti, including the well-known and popular Christmas cactus. Epiphytic cacti are not parasites. An epiphyte uses another plant or tree for support but does not take nutrients from it. A parasite will take its nourishment from its host tree, and will often kill it. Little pockets of humus, formed by rotting leaves, collect in hollows and crevices in the tree bark and epiphytic cacti root in these. They also have aerial roots, which absorb water from the moist air. Some epiphytic cacti have the most amazing flowers. 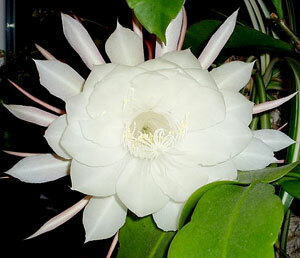 This is an Epiphyllum. You can see from the picture that it has broad, flat stems that look like leaves. The beautiful white flowers can be as much as 20cms across. They open at night and are sweetly scented.